Does your company attend many trade shows, conventions & events over the course of the year? If so, you know that your display frames & hardware need to be top-notch, strong & reliable, the graphic prints vibrant & superb. The cases need to withstand the beatings in transit & shipping with UPS or FedEx, keeping the contents inside well-protected. The displays listed in the economy section are good to go, backed with warranties and all. However if you're attending several events per year, your trade show display is an investment that needs to hold up and perform as such. This is where we get into the higher-end exhibits - still including the best prices and service on all of it, of course. 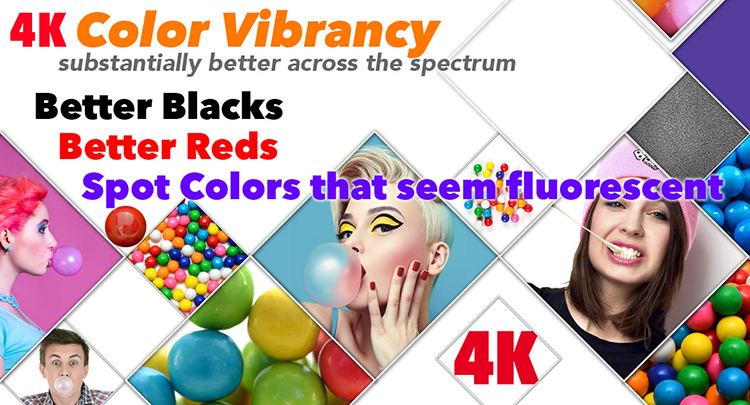 4K Print Technology™ is simply put, the best dye-sub process the display & event industries have ever had and the best on the market, period. Pressing print on a printer is one thing, but producing Color Beyond Compare is another. How has Optima done this? Think of Optima as a restaurant that utilized all the skills of the kitchen team, financial resources, ingredients, and several passionate chefs to create the “best meal you have ever had”. By virtue of a team, experience, desire, and abilities to experiment, Optima has created something truly unrivaled in the US. The first thing you will see is absolutely striking color that’s vividness is what could be found in Lithography or Giclee printing. What you won’t see is a dot pattern. Yep, no dot pattern to the visible eye. This means gradations are fluid, text can be 6 pt., skin tones are real and you'll be able to provide that “pop” or “punch” that you're ultimately looking for.